Symmetrix is the world’s most powerful storage. More than 20 years ago, Symmetrix introduced the first high-end enterprise storage array—the Symmetrix 4000. With each new Symmetrix, EMC elevated the industry standard for performance, scale, and capability of enterprise storage, and continuously maintained its position as the global high-end storage leader. Symmetrix is also the world’s most trusted storage, having released several first-to-market innovations that further defined the industry. 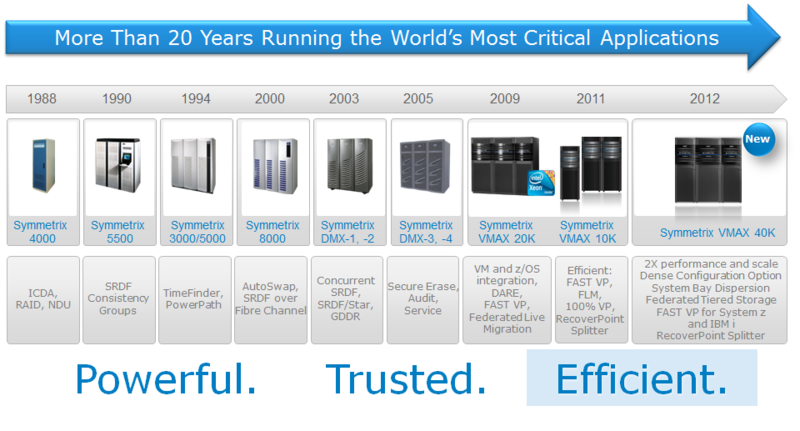 From the very first Intelligent Cached Disk Array (ICDA), to local and remote replication, to advanced security and data protection solutions, Symmetrix has always been trusted to perform in the most mission-critical and demanding environments anywhere, including those in Banking, Manufacturing, and Government and Defense, to name a few. And with a proven track record of being both powerful and trusted, Symmetrix, with its advanced development, is also the smartest storage. With Intel technology inside, Symmetrix VMAX 40K, 20K, and 10K platforms are again leading the industry with new innovations, including Fully Automated Storage Tiering for Virtual Pools (FAST VP), new levels of encryption with RSA, groundbreaking new models for nondisruptive data movement with Federated Live Migration, and the industry’s best storage for virtual server environments. EMC recently introduced the newest Symmetrix array, the Symmetrix VMAX 40K, which delivers two-times the performance and scale over the current Symmetrix VMAX, and flexible deployment options such as the Dense Configuration Option and System Bay Dispersion for space-constrained data centers. Note to Presenter: Click now in Slide Show Mode for animation. The Symmetrix VMAX 10K provides an entry point for companies looking to move into the high-end Symmetrix family. Symmetrix VMAX 10K is specifically optimized to include capabilities like Virtual Provisioning and FAST VP as standard, to best serve a set of customer requirements EMC has identified, which we will cover in detail. While Symmetrix VMAX 40K and 20K are powerful, trusted, and smart, Symmetrix VMAX 10K is powerful, trusted, and efficient. We’ll talk about all the ways that Symmetrix VMAX 10K is more efficient for your needs. Overall, EMC has a very complete storage portfolio, and it’s grown even stronger with the new Symmetrix VMAX 40K system. EMC’s VNX family of products provide a solution for unified file and block, with a scale-up architecture that is flexible and optimized for price and performance. The Symmetrix VMAX 10K is the ideal entry-point into the VMAX family delivering multi-controller performance, scale, and efficiency for cost-effective application consolidation in virtual environments. The Symmetrix VMAX 20K purpose-built for performance demanding virtual data center environments while the new Symmetrix VMAX 40K is purpose-built for hybrid cloud environments, providing the industry’s highest level of consolidation, performance, and efficiency. The Symmetrix VMAX 20K and 40K sit at the top for advanced, large-scale consolidation and to serve the maximum performance requirements, in both open systems and IBM System z and IBM i mainframe environments. With so many options, let’s now take a more prescriptive look at choosing among VNX, VMAX 10K, and EMC’s highest-end storage, the Symmetrix VMAX 40K. VNX is the primary unified option, offering a Dual Controller with capacity scaling up to 1,000 drives. VNX offers the most cost-effective solution for capacity scale. VNX should be considered when you are seeking a price and performance benefits for I/O and bandwidth, an integrated file and block solution, and where ease of use is required along with full multi-site replication. When the highest levels of scale, capacity, availability and high performance levels are essential, IBM Mainframe and iSeries may be needed and full replication and high customization are required, Symmetrix VMAX 20K or 40K are the most appropriate choice. VMAX 40K offers up to eight Engines and 3,200 drives, providing support for mainframe and IBM iSeries. The Symmetrix VMAX 40K is EMC’s most customizable solution with the highest scaling capabilities, performance, and feature sets. 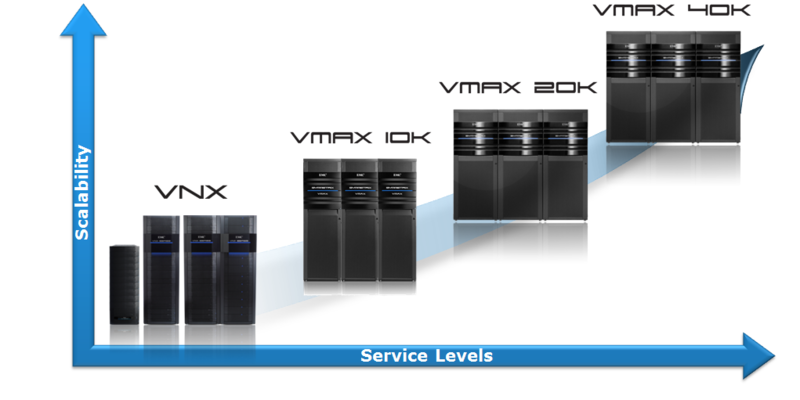 VMAX 10K is nicely positioned between VNX and the VMAX 20K and VMAX 40K in terms of controller scalability. VMAX 10K comes with the Advanced Software Suite with the key software capabilities that provide most customers the software applications that are needed in today’s data center. VMAX 10K is ideal for high-end, midtier enterprises looking for more than a dual-controller solution, yet with a more affordable entry price than VMAX. VMAX 10K is custom designed, packaged, and priced for FAST-optimized drive mixes, and RecoverPoint is the primary replication offering with SRDF for those familiar with SRDF technology. For companies moving up to Symmetrix-class reliability, availability, and serviceability who require NAS file support, VMAX 10K supports a VNX gateway and can easily be attached to VMAX 10K delivering a unified file and block storage solution. In 2009, EMC announced its vision and strategy of Fully Automated Storage Tiering (FAST). FAST is automation software that puts the right data to the right place at the right time. When EMC delivered the first version of FAST, customers were able to realize significant cost, energy, and floor space benefits. Now, FAST for Virtual Pools (FAST VP) delivers even greater efficiency and performance. It uses simplified policies to manage virtual storage pools and does this with built-in automation and intelligence. EMC has made FAST VP a priority in its advanced development labs. With more than 30 PhDs working with hundreds of customers, EMC analyzed over 4,000 of its customers’ applications’ access to information. 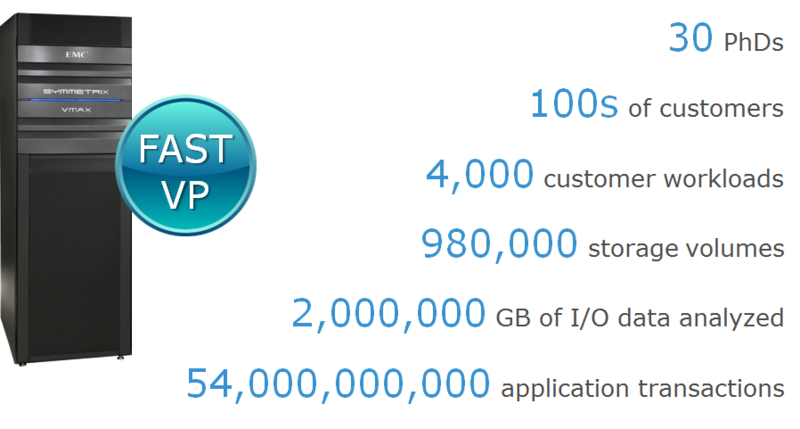 EMC has further analyzed almost one million volumes of information in more than 2 PB of customer statistics and analyzed over 54 billion I/O transactions.